Will fracking contaminate groundwater or surface water? Are there climate impacts from fracking? Are there long-term environmental risks from fracking? Does fracking create human health impacts? I have heard these and many other such questions dozens of times. My usual response is reminiscent of a well-known and oft-repeated line by Deforest Kelley (Dr. McCoy of Star Trek fame): I’m a lawyer, not an engineer, or a geologist, or a hydrogeologist, or a scientist, or a medical professional. Indeed, my consistent position has been that the risks of hydraulic fracturing, whatever they may be, need to be evaluated and assessed by professionals with the requisite expertise. Thus, I have always been interested in reading thorough, unbiased scientific analyses prepared by well-qualified experts. In connection with recent and upcoming speaking engagements, I reviewed several of the more recent and reputable scientific reports that crossed my desk. One in particular that deals with hydraulic fracturing in California is directly relevant to the issues discussed on the blog and worthy of a brief summary here. The BLM requested a rigorous, independent expert assessment in order to gain a comprehensive understanding of the best available science and potential impacts of using well stimulation technology in the unique geology of California. Information from the independent science review will be incorporated into future oil and gas lease sales and permitting statewide. The work is being coordinated with the California Natural Resources Agency (CNRA) and the California Department of Conservation (DOC), which is implementing a similar effort directed by California Senate Bill 4 (SB 4). The findings of this CCST report describe current well stimulation activities in California, how, when and where they are currently applied, where they might be applied in the future and how this practice differs from other states. The report assesses information relevant to the potential future use of these technologies, and how they might or might not directly impact water supply, water quality, air quality, greenhouse gas emissions, seismicity, ecology, traffic and noise. What are the past, current and potential future practices in well stimulation technologies including hydraulic fracturing, acid fracturing, and matrix acidizing in California? 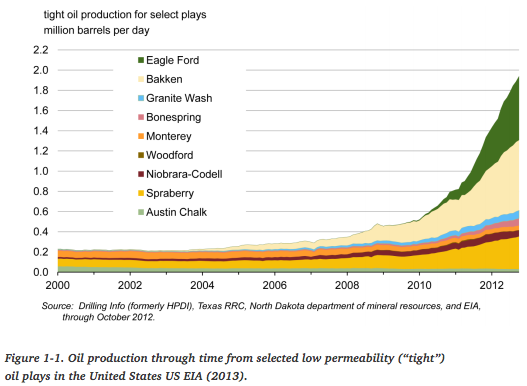 Where will well stimulation technologies allow expanded production of oil onshore in California? What are the potential environmental hazards of well stimulation technologies in California? Responding to these three questions, the report reached eleven major conclusions, summarized in Chapter 1 of the report. Chapter 1 includes much additional discussion and description of the report’s findings, and extensive discussion of the underpinnings of the report may be found in the subsequent chapters. We will, however, merely list the major conclusions, as follows. Key Question 1: What are the past, current and potential future practices in well stimulation technologies including hydraulic fracturing, acid fracturing, and matrix acidizing in California? Conclusion 1: Available data suggests that present day well stimulation practices in California differ significantly from practices used for unconventional shale reservoirs in states such as North Dakota and Texas. For example, California hydraulic fractures tend to use less water, the hydraulic fracturing fluids tend to have higher chemical concentrations, the wells tend to be shallower and more vertical, and the target geologies present different challenges. Therefore the impacts of hydraulic fracturing observed in other states are not necessarily applicable to current hydraulic fracturing practices in California. Conclusion 2: Acid fracturing is a small fraction of reported WST to date in California. Acid fracturing is usually applied in carbonate reservoirs, and these are rare in California. Matrix acidizing has been used successfully but rarely in California. These technologies are not expected to lead to major increases in oil and gas development in the state. Key Question 2: Where will well stimulation technologies allow expanded production of oil onshore in California? Conclusion 3: The most likely scenario for expanded onshore oil production using WST in California is production in and near reservoirs that are currently using WST. Thus, existing and likely future production is expected to come from reservoirs containing oil migrated from source rocks, not from the Monterey Formation source rock. 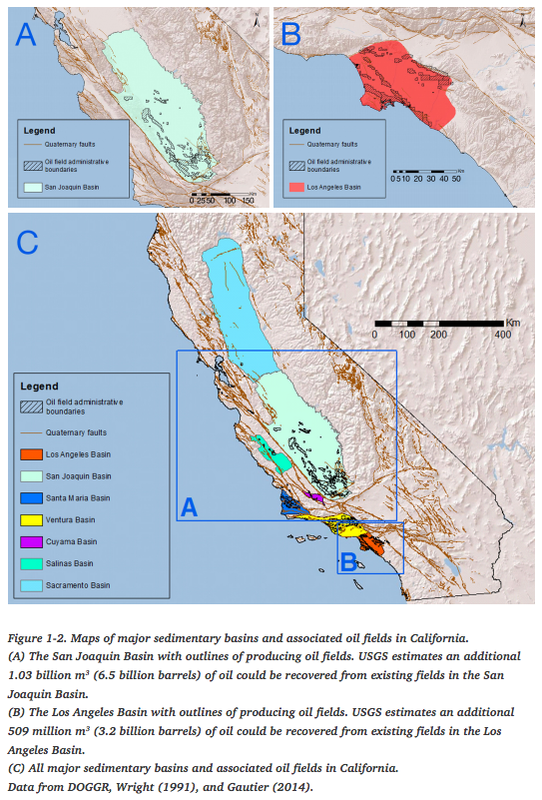 Credible estimates of the potential for oil recovery in and near 19 existing giant fields (> 1 billion barrels of oil) in the San Joaquin and Los Angeles basins indicate that almost 10 billion barrels of additional oil might be produced but would require unrestricted application of current best-practice technology, including, but not restricted to WST. In 2011 the EIA estimated about 15 billion barrels of technically recoverable oil from new plays in the Monterey Formation source rock, but these estimates have been revised in 2014 to a value of 0.6 billion barrels. Neither of these estimates of unconventional oil resources in California source rocks are well constrained. Key Question 3: What are the potential environmental hazards of well stimulation technologies in California? Conclusion 4: While current water demand for WST operations is a small fraction of statewide water use, it can contribute to local constraints on water availability, especially during droughts. Conclusion 5: Of the chemicals reported for WST treatments in California for which toxicity information is available (compiled from the voluntary industry database, FracFocus), most are considered to be of low toxicity or non-toxic. However, a few reported chemicals present concerns for acute toxicity. These include biocides (e.g., tetrakis (hydroxymethyl) phosphonium sulfate; 2,2-dibromo-3-nitrilopropionamide; and glutaraldehyde), corrosion inhibitors (e.g. propargyl alcohol), and mineral acids (e.g. hydrofluoric acid and hydrochloric acid). Potential risks posed by chronic exposure to most chemicals used in WST are unknown at this time. Conclusion 6: There are no publicly recorded instances of subsurface release of contaminated fluids into potable groundwater in California, but a lack of studies, consistent and transparent data collection, and reporting makes it difficult to evaluate the extent to which this may have occurred. Existing wells are generally considered as the most likely pathway for subsurface transport of WST and subsurface fluids (water, brines, gas). California needs to characterize this potential hazard in order to evaluate risk to groundwater resources. In California, hydraulic fracturing is occurring at relatively shallow depths and presents an inherent risk for fractures to intersect nearby aquifers if they contain usable water. Fracturing has occurred in many fields at a depth less than 600 m (2000 ft). Available research indicates 600 m is likely the maximum distance for vertical propagation of hydraulic fractures, although the maximum vertical length of a fracture may be less than 600 m for fracturing in shallow formations because of the different stress conditions. California needs to develop an accurate understanding about the location, depth, and quality of groundwater in oil and gas producing regions in order to evaluate the risks of WST operations to groundwater. This information on groundwater must be integrated with additional information to map the actual extent of hydraulic fractures to assess whether and where water contamination from WST activities has been or will be a problem. Conclusion 7: Current practice could allow flowback water to be mixed with produced water for use in irrigation. California needs to monitor the quality of flowback/produced water and review regulations on the appropriate use of flowback/produced water, based on its quality and the intended uses. Conclusion 8: Estimated marginal emissions of NOx, PM2.5, VOCs directly from activities directly related to WST appear small compared to oil and gas production emissions in total in the San Joaquin Valley, where the vast majority of hydraulic fracturing takes place. However, the San Joaquin Valley is often out of compliance with respect to air quality standards and as a result, possible emission reductions remain relevant. Conclusion 9: Fugitive methane emissions from the direct application of WST to oil wells are likely to be small compared to the total greenhouse gas emissions from oil and gas production in California. This is because current California oil and gas operations are energy intensive. However, all greenhouse gas emissions are relevant under California’s climate laws, and many emissions sources can be addressed successfully with best-available control technology and good practice. Conclusion 10: Hydraulic fracturing rarely involves large enough volumes of fluids injected at sufficient rate to cause induced seismicity of concern. Current hydraulic fracturing for oil and gas production in California is not considered to pose a significant seismic hazard. In contrast, disposal of produced water from oil and gas production in deep injection wells has caused felt seismic events in several states. Expanded oil and gas production due to extensive hydraulic fracturing activity in California would lead to increased injection volumes for disposal. If this produced water is disposed of by injection and not handled through an expansion of water treatment and re-use systems, it could increase seismic hazards. Conclusion 11: Based on Conclusions 1 through 10 above, the direct impacts of WST appear to be relatively limited for industry practice of today and will likely be limited in the future if proper management practices are followed. If the future brings significantly increased production enabled by WST, the primary impacts of WST on California’s environment will be indirect impacts, i.e., those due to increases and expansion in production, not the WST activity itself. Indirect impacts of WST through WST-enabled production will vary depending on whether this production occurs in existing rural or urban environments or in regions that have not previously been developed for oil and gas — as well as on the nature of the ecosystems, wildlife, geology and groundwater in the vicinity. After stating its major findings, the report adds extensive analysis of advanced well stimulation technologies (Chapter 2), the history and current application of well stimulation technology in California (Chapter 3), the prospective application of well stimulation technologies in California (Chapter 4), and the potential direct environmental effects of well stimulation (Chapter 5). This report will serve as a basis for the upcoming study of hydraulic fracturing being conducted by CCST and LBNL under California’s SB 4. The first portion of that study, dealing with geology and well stimulation treatments, is due for release by January 1, 2015. Subsequent portions on generic and potential environmental impacts of well stimulation treatments and case studies of hydraulic fracturing are expected by July 1, 2015.